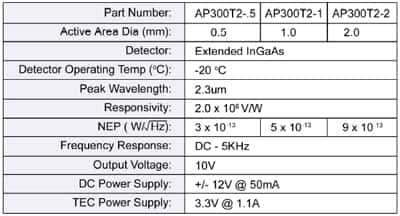 Compact Size - 1.5" Dia x 2.5"
The AP300-1-T2 is an amplified inGaAs senson with a 2-stage thermo-electric cooler (TEC). 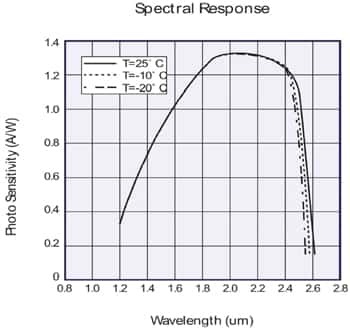 A low noise amplifier provides detector-noise limited performance in a compact package. The 2-stage TEC ensures low noise operation up to 2.6um and a large 1mm2 active area provides generous light collection. All that is needed is a DC power supply. OEM custom configurations welcome. Please contact us to discuss your requirments. New England Photoconductor has manufactured Infrared Detectors since 1973. During this time NEP has met detector and electronic requirements for applications ranging from gas analyzers to satellites. Linear and Focal Plane Multiplexed Arrays, our latest introduction to the market, brings innovation and low cost manufacturing to the Spectroscopy and Imaging markets.